Synopsis: Poverty, food insecurity and malnutrition have become critical urban problems. Meeting this challenge in many cities around the world, women play a crucial role in household food production, growing vegetables in gardens and vacant urban spaces, raising animals, and trading in fresh and cooked foods. They boost household nutrition as well as generate income and build social inclusion among the urban poor. Women’s vital contribution, however, has largely been neglected by city officials, economic planners and development practitioners, who have tended to concentrate on the industrialization of food production. Women Feeding Cities analyzes the roles of women and men in urban food production, and through case studies from three developing regions suggests how women’s contribution might be maximized. In the second part, detailed guidelines and tools show how to bring women into the mainstream of urban agriculture research and development. Providing evidence from around the world as well as field-tested guidelines, this book is essential reading for policy makers, planners, researchers and practitioners working on urban agriculture programs. This book arises from the Urban Harvest Initiative (CGIAR) and the Cities Farming for the Future programme (RUAF Foundation) and was made possible thanks to a grant from the International Development Research Centre (IDRC), Canada. 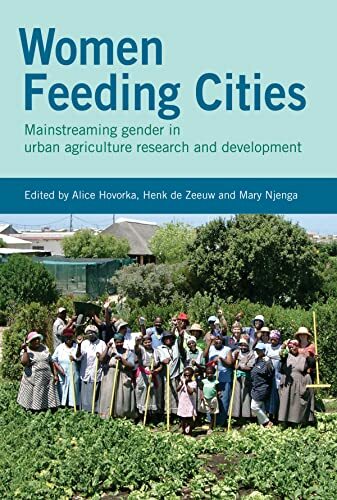 Book Description&colon; Women Feeding Cities analyzes the roles of women and men in urban food production, and through case studies from three developing regions suggests how women’s contribution might be maximized. In the second part, detailed guidelines and tools show how to bring women into the mainstream of urban agriculture research and development. Providing evidence from around the world as well as field-tested guidelines, this book is essential reading for policy makers, planners, researchers and practitioners working on urban agriculture programs.